When you stay in one place for a long time, you get to know the locals and their daily lives.. At the same time, you begin to add some color to the place you are visiting because everything around you takes on life, everything has an explanation. The locals are at the heart of Keelung culture. 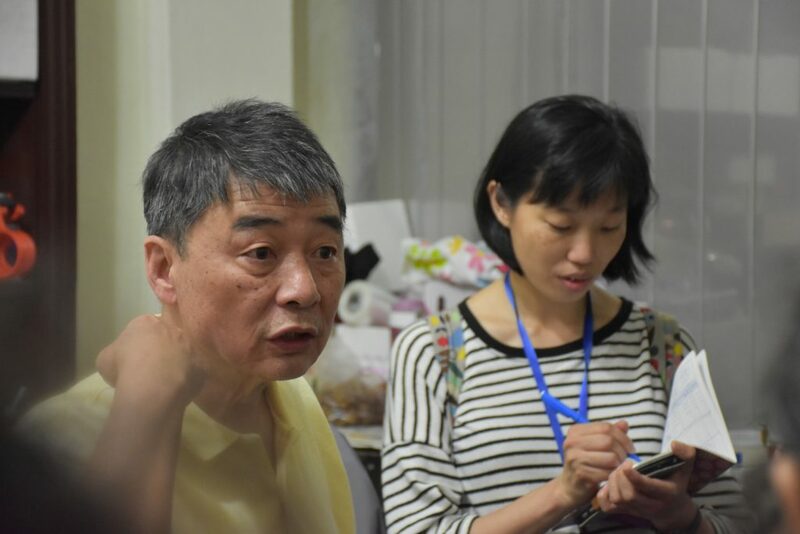 Mr. Peng is one of the people I've met with several times thanks to organized tours from Keelung-for-a-walk, and he knows a lot about fish. The fishing industry has a deep history that is intertwined with Keelung culture. In fact, Mr. Peng is a fish auctioneer; he is more than 70 years old and has done this work for 60 years! 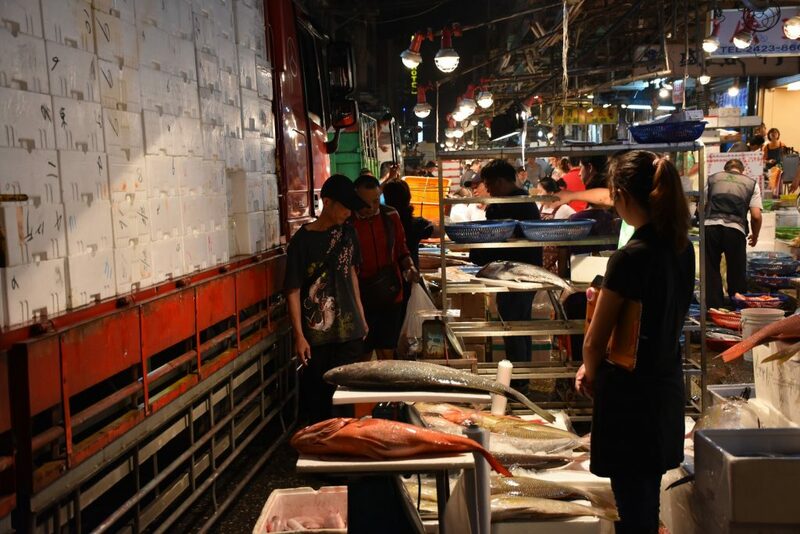 In a previous post, I mentioned that the Keelung fish market is the biggest in northen Taiwan…so I guess Mr. Peng probably knows everything there is to know about fish. I imagine that he has seen so many things in the fish market over the years. I'm not going to talk about everything he said to us, about the way he communicates with customers, the changing fish auctioneers throughout history, the main figures hovering over the fish market and how to recognize them, or anything like that. Instead, I want to emphasize his passion for his work, for everything concerning the world of fish. He has become the bearer of local traditions, and he is always eager to share with you his pride as a Keelunger and his many experiences that perfectly reflect the heart of Keelung culture. You can find another person who is very proud of his origins, the son of a fish auctioneer near Keelung, in his little eclectic museum. 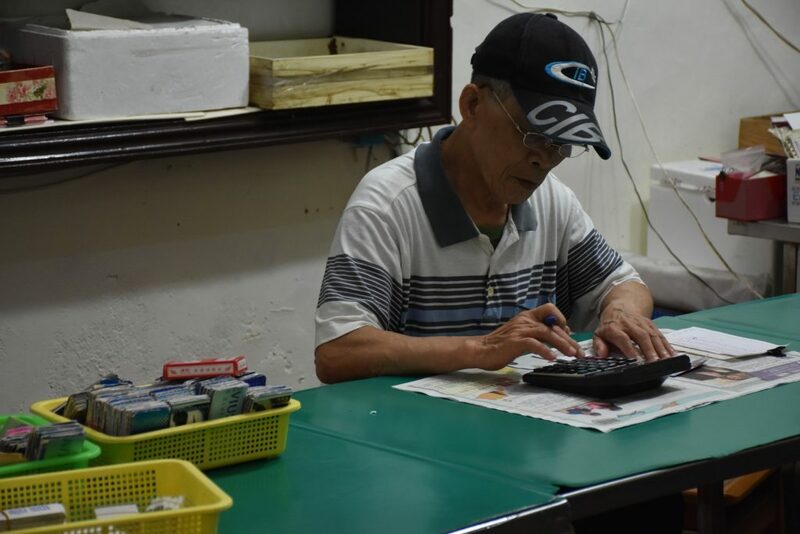 This gentleman over the years has accumulated a number of treasures related to the sea: model boats of different styles and periods, bricks from the Qing era, fishing nets, ship wheels, and an array of gadgets that I would never be able to name. It's hard to get here without a guide, and the museum is really hidden. To know that there are people who are so passionate to tell their story and so proud of their past, gives me life. Keelung culture definitely has a lot more to offer than it appears at first glance. Quando resti per un lungo periodo in un posto, impari a conoscere la gente del posto e la loro vita. Allo stesso tempo, incominci ad aggiungere un po' di colore al posto che stai visitando perche' vedi che tutto intorno prende vita reale, tutto ha una spiegazione. La gente del luogo e' il cuore della cultura di Keelung. Mr. Peng e' una delle persone che ho incontrato piu' volte grazie ai tour organizzati da Keelung for a walk ed e' un pozzo di conoscenza per quanto riguarda il tema del pesce. L'industra del pesce ha una profonda storia che e' interconnessa con la cultura di Keelung. Infatti Mr. Peng e' un venditore di pesce, ha piu' di 70 anni e fa questo lavoro da sessant'anni. In un post precedente ho gia' accennato al fatto che il mercato del pesce di Keelung e' il piu' grande a Taiwan...quindi direi che Mr. Peng ne sappia veramente qualcosa riguardo al pesce, e immagino che ne abbia viste di tutti i colori. Non staro' qui ora a parlare di tutto quello che ci ha detto, dei modi di comunicare con la clientela, dell'evoluzione di questi modi durante la storia, chi sono le figure principali tradizionali che si aggirano al mercato del pesce e come riconoscerle e cosi' via. Voglio invece sottolineare la sua passione per il suo lavoro, per tutto cio' che riguarda il mondo del pesce, delle tradizioni di cui si fa portatore, del suo orgoglio di essere un abitante di Keelung e delle sue esperienze che riflettono perfettamente il cuore della cultura di Keelung. Un'altra persona che va molto fiera delle sue origini, figlio di pescatore, lo si puo; trovare nei pressi di Keelung. Questo signore durante gli anni ha accumulato una serie di tesori legati al mare: modellini di barche di diversi stili e periodi, mattoni appartenenti all'epoca Qing, reti, timoni e una serie di aggeggi di cui non saprei neanche fare il nome. E' difficile arrivare qui senza una guida e il museo e' veramente nascosto per sfortuna. Ma sapere che ci sono queste persone cosi' appassionate di raccontare la loro storia e cosi' orgogliose del loro passato, mi rigenera. Perche' la cultura Keelung alla fine ha da offrire veramente molto piu' di quello che appare ad un primo sguardo. Learn more about Keelung's seafarers with us today!